Want to go on a hunt, but find it difficult to decide what is the best hunting tripod? You are probably overwhelmed by the number of choices. Turns out, the choice is not as challenging as it seems. All you need is to get acquainted with the features to pay attention to while making a decision. Here is the ultimate guide for choosing a good tripod stand that allows you to spot more comfortably and for a longer period. 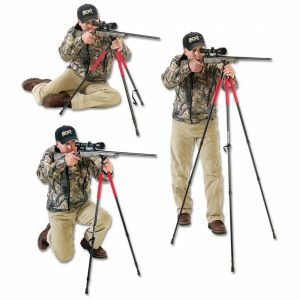 A tripod stand is extremely useful for hunters. It offers a stable rest from where you can shoot thereby making your hunting game more satisfactory. Sure, you can use an improvised log for support in the short run. However, you need something more comfortable for long distance hunting. This is exactly what this accessory has to offer. Perhaps you are confused about what you want. We have a list of top-selling models with a wide array of features. As a top-rated site for hunting accessories, we are here to assist you in making an informed choice! 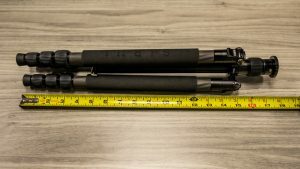 Which tripod is best for hunting? A hunting rifle tripod has three legs and mounts. It holds a camera, rifles, binoculars, etc. These models are more complex than tripods for guns since they support other hunting tripod accessories too.A good stand has a multifunctional design and blends perfectly with the hunting environment. To get the most out of your scope tripod look for stability and strength. Don’t worry because we have done the research and below are the most important features to look for. 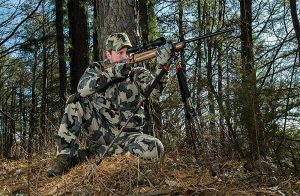 From hunting binocular tripod stands to rifle ones, there are numerous hunting accessories in the market. This a great supporting tool for your gun and optics e.g. spotting scope and binoculars. The best hunting tripod for spotting scope provides a stable view at a distance. They are ideal for stand hunters who don’t need to hike around when stalking prey. If you love roaming the forest, the best shooting tripod (hunting rifle tripod) is a great investment as it allows you to be certain with your shots. The vast majority of tripods for hunting are made with aluminum legs while others are made of carbon fiber. Carbon fiber is lightweight and stable. As such, these devices are better options for supporting high-magnification spotting scopes because they prevent vibration and shaking. However, they are more expensive than aluminum. Aluminum, on the other hand, is sturdy but heavier than carbon fiber. It is the safest options when you need to use a bigger spotting scope. On the flip side, aluminum is prone to scratches and damage by the elements. So you might want to get one made of carbon fiber, if you are planning to hunt for the long run. A stabilizer needs to have considerable weight. If you hike over countless miles, hunting for deer, ensure you’ve picked best lightweight hunting tripod. With a lightweight spotting scope tripod, you’ll save energy while on the hunt and spend more time in the field. For stand hunters who don’t need to move so often, weight is not much of a big concern. Considering the weight and size of your spotting scope is imperative. In the past, the accessories made of metal were most recommended, but today, carbon has advanced and offers the same durability and stability as metallic counterparts. The minimum and maximum height of a tripod is measured in inches with the minimum being more important when mounting a gun. When it comes to tripod height vs. your height, it’s all about the usability of the equipment. If you have above-average height, consider an angled spotting scope but make sure you understand the differences between angled vs. straight spotting scopes. The best compact tripod for spotting scope has a tabletop size ranging from 8 to 18 inches. While you can comfortably use a short one, a taller model is more recommended for a full hunting experience. Tall stands provide better stability and you don’t need to adjust the center column too often to align with your eye level. Another important consideration when searching for the best tripod head for hunting is the tripod head. This element holds the binoculars, spotting scope, camera, or telescope. Its weight capacity and the motion it provides are important. If you have a spotting scope with higher magnification power and a bigger objective lens, look for a more robust and heavy-duty tripod head. The quantity of these heads you get in the market is overwhelming. Generally, they fall into 3 categories. Ball head: the head connects to the ball’s top, allowing you to move it in the desired direction with a single move. Ball heads come in numerous varieties, some have trigger locks while others have typical lever locks. The biggest benefit of using a ball head is quick adjustment. However, you will be limited in the amount of weight you can load on the ball head. It is an ideal option for travel tri, mono, and mini pods. 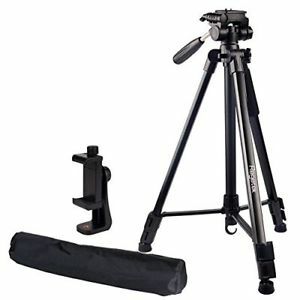 Two-way tripod head: Also known as a camcorder or video tripod head, it is the most common design in the market. It provides two motions – horizontal and vertical. Three-way tripod head: As the name suggests, you can move the spotting scope in three directions: horizontally, vertically, and sideways. It is especially useful for professional photographers since it can change a horizontal frame into a vertical frame picture. Whatever choice you make, ensure the tripod features smooth panning and easy adjustment. Otherwise, you’ll be frustrated with your scoping efforts. There are numerous tripods for hunting and the most important features to look for are sturdiness and stability. This is especially true if you have a high-magnification spotting scope. 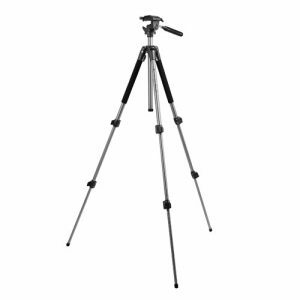 A sturdy tripod offers the steadiest view and a great value for money. Ultimately, the right hunting tripod depends on your intended purpose. If you’re in the market for a new tripod to take out on your hunts, check out our detailed reviews of seven top-selling products to help find the best hunting tripod. 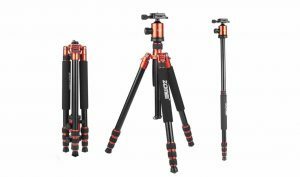 Each review outlines the key features of the individual tripods including their type and the materials they’re made of. In addition, we’ll address a few pros and cons so you’ll have enough information to decide which is the best hunting tripod for your needs. 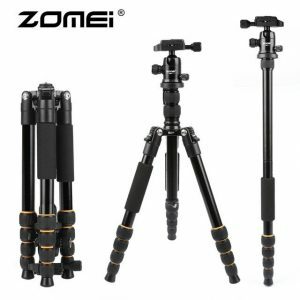 Zomei Q55 Tripod is a lightweight hunting tripod that features 4-section tubes. These legs can be adjusted individually at 25, 50, and 80 degree angles. It’s ideal if you’re traveling light and still need to achieve incredible shots. The legs feature non-slip bottoms which is useful if you’re looking to set up in various conditions. As a spotting scope, this tripod from Zomei is meant to support optics so you can capture incredible views. It’s made from durable, anodized aluminum alloy, and can collapse with ease to an easy-to-carry height that’s further aided by its weight. 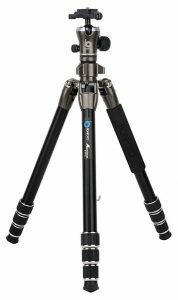 The Zomei Q555 is the go-to lightweight hunting tripod you can take just about anywhere and use for panoramic shots. A quality compact tripod for spotting scope mounting is the Neewer Carbon Fiber Tripod as it can adjust to an ultra-low height. 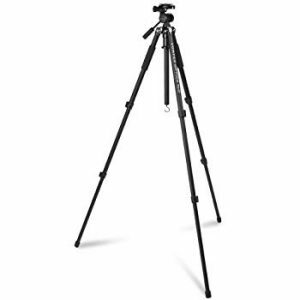 If it’s more flexibility you want in your shooting, this tripod has a 3-position leg angle. You can convert the center column for low shooting, and you can use one of the legs as a walking stick or monopod. This Neewer spotting scope is made from carbon fiber that’s lightweight yet sturdy. 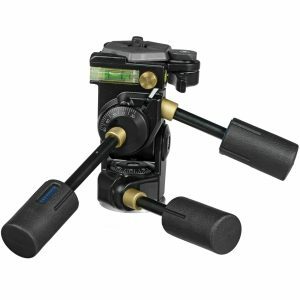 It folds down with ease, and the swivel ball head helps transition faster between shots. 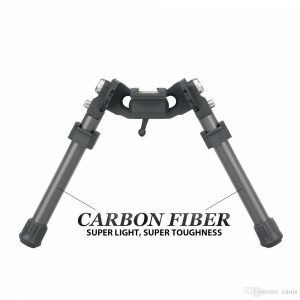 Neewer Carbon Fiber Tripod is lightweight, easy to adjust, and can hold over 20lbs. It’s even a 2-in-1 tool as you can use it as a monopod. The Regetek Tripod can be swiveled 360º horizontally and 90º vertically, and it features a tripod adapter for portrait mode and landscape mode. With the ability to easily mount binoculars, it’s the best hunting binocular tripod you can find if you need to use the tripod for more than one item. Its quick-release plate allows for rapid device changes. As a spotting scope, this tripod from Regetek can hold around 8lbs. The aluminum design makes it relatively light, and it features a 3-way flexible pan and tilt head for various photo capturing. The Regetek Tripod has a 3-way head for greater panning and flexibility for greater variety, and it has a monopod feature. The Bog-Pod CLD Camo Shooting Rest with Lightweight Design has adjustable legs that can be independently angled 40º in addition to adjusting tension. It’s the best tripod for spotting scope shooting thanks to the rubber rest where you can place your firearm. Furthermore, it has an all-terrain foot system and rubber feet that can adjust to a steel tip to grip ice. To prop up your hunting rifle, this Bog-Pod features a universal shooting rest that’s covered with rubber to avoid damage to your firearm. The height adjusts enough to be used either sitting, kneeling, or standing. This Bog-Pod CLD Camo can make hunting easier, especially with the versatile traction on the legs for use in various weather conditions. Bushnell 784030 Advanced Tripod is full-sized, so it’s not intended for portability purposes. It’s a top-performing Bushnell spotting scope tripod, and it helps those who seek a long-lasting tripod. The finish is rugged as it’s designed with a corrosion-resistant finish and durable aluminum legs. It also has three padded foam leg cushions. This spotting scope can support binoculars, cameras, a camcorder, and more. It has a large mounting platform to support the 3-way head, and the height is easily adjustable as you can adjust the legs individually. Bushnell 784030 is a sturdy tripod for those who have no intention of carting it around. It features a universal mount and can handle itself in cold or hot conditions. The Vortex Optics Pro GT Tripod is a reliable product that allows for easy horizontal and vertical adjustments. If you’re looking for a sturdy hunting rifle tripod, this one from Vortex Optics features rugged anodized legs and a balance hook. The balance hook can hold extra weight at the bottom of the center column, which allows for stability in case of wind. This spotting scope is designed to perform under different conditions, and the quick-release function for the 3-way head is smooth and easy to use. Vortex Optics Pro GT tripod features a quick setup and a good amount of durability for use under different weather conditions. If you need a lightweight tripod for hunting, the BONFOTO 671A is one of the best for the job. It features a detachable monopod, and it’s easily foldable. 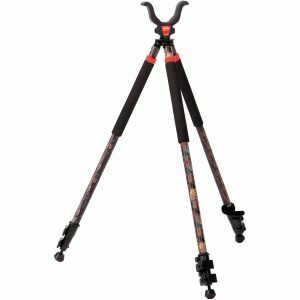 For those who need something to withstand different environments, this tripod has high-friction rubber feet to keep the legs from sliding out. It’s also useful as a trekking pole. The ball head can be installed upside down for close-up use, and it’s lightweight enough so you can move it around with ease. It has a good height range that’s straightforward to use. The BONFOTO 671A is a good travel tripod with a unique ball head that has a compass and bubble level. It has steady legs and can be used for multiple purposes. 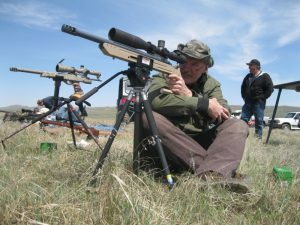 After reading the reviews, do you still have a few concerns about how to choose the best tripod for hunting? 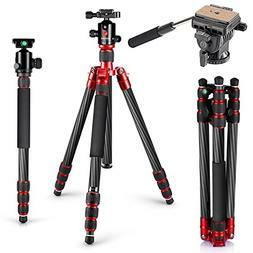 If so, we have the answers to a couple common questions such as the materials and accessories that may come with these tripods. What is the best material for a hunting tripod? Most tripods for hunting are made from aluminum. Aluminum alloys are naturally weather-proof, which makes them survive outdoors in various conditions. Aluminum is also lightweight so it can be moved around with ease. On the other hand, material like carbon fiber is even lighter. At the same time, it’s seen as stronger than aluminum while also having good corrosion-resistance. Looking at the two materials, carbon fiber may be the better option if you want to transport it and have it hold up over time. Do the hunting tripods come with bags? 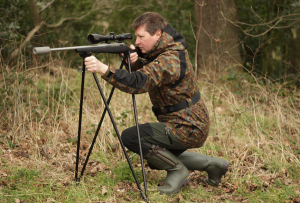 When it comes to hunting tripod accessories, many come with bags. The quality of the bag varies, so it’s better to do some research on the materials they’re made from. Bags while not a necessity have the benefit benefit of allowing you to pack up and carry the tripod easier. If you’re looking for a compact hunting tripod, a quality model should be able to fold down enough so it can fit inside your own backpack. The best hunting tripod for the products we’ve reviewed is the Zomei Q555 tripod. It offers great panoramic shooting, non-slip feet, and it’s lightweight. The Zomei Q555 tripod is the best value you can find to achieve wonderful shots. We hope you’ve enjoyed our overview of seven of the best hunting tripods on the market.